Total messages posted 103 messages. I just wanted to Thank you for great season and I know that you are ready to shoot again. 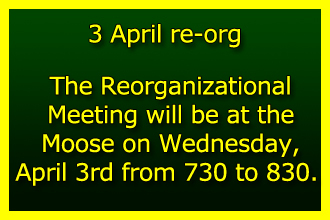 Next week, The reorganizational meeting will be at the Moose and will start promptly at 730. This year, you will be electing all new officers so be thinking who you want to lead you into another fantastic season. I hope that you enjoy your time off and I look forward to seeing you next week. NICE YOU POSTED ABOUT THE BANQUET. GOOD VENUE FOR IT. AND 7PM IS A GOOD START TIME. BUT ON DATE IS ON? Congratulations to Ticket IIB on winning the league playoffs last night. Thanks Anne Marie. I didn't notice any of the league officials at our game, so thought I would post the win on the comment board so whoever keeps track of this at the league level would know who won in our match. Nine mile 5 won over Legends 1 on 3/13, 6.5/3.5. If you didn't get to see the first round of playoffs last night you missed out. The games that I saw were down the 8 ball games with great defense, good strategies and some of the best sportsmanship that I have seen in a while. Congratulations! I look forward to watching some more games next week. Karl there will be 3 weeks of playoffs. On March 27-will be the banquet and then on April 3 will be reorganizational meeting. I want to thank everyone for the years of friendship and player pool with one another. If you haven't heard, I'm moving back to Texas to be with my family. I can't tell everyone enough the joy I have had throughout the years. You will all be truly missed. Charlie, 2/20/19, AL 240A played Tickets 2B, Ben Angeles was technically blind for the 1st 2-rounds, so our 1st 2-players, Tim June and myself won 10 to 0. When I entered the scores, I recorded them in the Absent Player spot for Tickets 2B. Rounds 3-5 was played by a substitute --Brittany Ward. Hope this was the correct way, otherwise Ben would have 2 games with a ZERO score!! WHERE IS SHARONS CORNER BAR ????? Please when you are playing pool, PLAY POOL!!! Our game 2nite was 5 hrs long because the team was not paying attention and dancing. Some ppl have to get to work/school the next morning. Jan, Several people have asked but no one seems to know anything other than what was reported on the news about the accident. Has anyone heard any news about Anita Lamb??? Please keep Michael & Debbie Bradley in your prayers. Over the weekend, Michael suffered a heart attack. He had a 90% blockage which required a stint. He is expected to be home in a few days so please respect their privacy as he recooperates. Our thoughts, strength, comfort, prayers and love for Jan. The local bars need to be updated on this site. Some of the bars are no longer open. Hi Karl- We voted on Thanksgiving & Christmas. There are so many families that would miss to spend time with kids on Halloween that I would rather take Wednesday off & shift the schedule by 1 week. I thought we voted on shooting on Halloween ..? Due to Halloween falling on Wednesday, we are taking the night off so families can be with their kids. We will resume play on November 7th. Hope everyone enjoys their evening. The league voted to not have 1st and second half winners. Best overall record at end of year and the top three teams in each league made playoffs. Winners of each league got a first round bye. 2 and 3 in each league played to see who shot the 1 seed for the winner of division. Each division winner shot for overall championship. I don't know how everyone else feels about this, but it wouldn't bother me if we just set everything back a week because of the hurricane, holding the halftime tournament on the 17th and starting the 2nd half of the league on the 24th. DUE TO HURRICANE MICHAEL - I AM CANCELLING THE TOURNAMENT FOR THIS WEDNESDAY. EVERYONE PLEASE BE SAFE AND TAKE CARE OF YOUR FAMILIES AND FRIENDS. I wanted to let everyone know that there will be a short memorial service for my husband Gary Johnson. This will take place at approx. 3:30p this Saturday before our annual meeting. Everyone is welcome. HI John - I do not see your name under Ticket 2 B but I do see your name under the 340 team. Chancies is located at 9401 N. Davis Hwy. It is across from the old taste-freez. thank you Jim. Did you receive my email? After much consideration, it has been decided that we will shoot tonight. Walter- Yes I will make a call after lunch. I will review the weather & updated road closures then. ANNE MARIE WHY CAN'T I DOWN LOAD THE RULES OF PLAY?????? It is with heavy heart that I let you know that Gary Johnson passed away earlier today. He & Jan played on Tickets at University B team. Please keep Jan & her family in your thoughts & prayers as she goes through this sad adjustment in her life. Still waiting for the PayPal Account ????? I totally agree with Nick ! ! Only takes a couple of minutes to set one up.... !! Where is the PayPal account? We shouldn’t have to drive across town to turn in our money. We are printing our own score sheets and entering our own scores but still have to turn in the money. I thought this was supposed to be easier. I want PayPal. As promised. I hope that everyone has a safe and Happy 4th of July. Whiskey Runners is in the running for Worst Tables in the league. Make a shot and watch cueball roll off 12 inches, curve around balls, stop and start rolling again. Don't know why their team is willing to play on them, but they think the crazy rolls are funny. Charlie, under Rule 8c, Amer legion 240A used our lowest player to shoot as a substitute BLIND for this week 6/20/18. How or were are these scores posted? Benny Jones shot for Ceylon Brown as he had to work last minute, no subs available to play. His play scored 5/50 , as a blind he also shot a 43, please advise, I will e-mail you as well, cuz our scores will not coincide . I need to make a correction on last weeks score sheet. Larry Johnson made an eight on the break and woody clary had a break and run. Also, there is still a pool stick behind the bar from D&R2. charlie, can you fix the spelling of my last name? Hi Warren - yes the scores have been entered. If you will look at the ready report (2nd selection on the left) it will show what you have entered. Cindy will work from that report to make sure all is balanced. This is Warren Jerrems from Red Cordova 2. First time user of the site. I entered the scores from last Wednesday but am not sure that the data has been "submitted" as the site seems to lack this site or I am missing it. Can someone please confirm that the scores have been accepted as entered? If Capt of sam's would call me, I'll put her info in over the phone..
We are in the process of trying to get in touch with the teams that have not yet registered. Some of the teams that I know are coming back, I am inputing their names to help get them started. Nick, Since no one has yet answered your question - yes - someone from your team will have to initially enter your team members. This person is usually the team captain, or whomever your team designates to take care of your electronic entries into the site. That person needs to "Enroll for Membership" in the upper left corner of the page, select an id and a pin, and after email verification by the site will then be given access to an area within the site where he/she will be able to enter your team members, as well as enter scores after your weekly match. Hope that helps answer your question. Sir Richards currently has 0 players according to this site. I’m printing the score sheet for tomorrow and our names are missing. Certainly I don’t have to go in there and fill out the names myself. Or do I? They fixed my averages... I am ready to play ! ! Does anyone know how to adjust the individual averages from last season..? The whiskey runners play out of what place? Just curious about handicaps. Didn't see anywhere to assign handicaps to players from last season, so everyone entered so far is assigned a new player handicap of 7.7. Is this the way we'll start this new season?